Adam began by presenting BRP research findings across topics such as digital commerce, merchandise planning, and customer engagement. He stated that according to Forbes, there will be more stores opening in 2017 than store closings. Stores will still represent the majority of retail purchases, but the definition of the store channel is rapidly changing. The store of the future represents a unique point of customer engagement rather than strictly a point of purchase. Today’s consumers expect a personalized experience whenever and wherever they choose to shop. Over the past year, the use of personal email has increased 85% with 45% of those retailers indicating it’s a successful and effective means of communication. The increase of tablets and mobile phones offers new opportunities for retailers to enhance their customer service. 89% of retailers will offer mobile solutions for sales associates and 84% will use mobile POS within the next 3 years. Real-time retail, through unified commerce, enables retailers to identify the customer, analyze data, and access product, pricing and inventory data across all channels instantly. 71% of retailers plan to implement a unified commerce platform by the end of 2019. Retailers need to establish security policies that ensure the data privacy of their customer’s information. 73% of retailers will offer a single token solution across their enterprise within 3 years. Unified Commerce breaks down the walls between internal channel silos and leverages a centralized, real-time platform. It combines in-store POS, mobile, eCommerce, order management, and client history into one integrated platform. Adam stated that 80% of retailers are focused on order management systems, CRM and centralized inventory management. The topics Adam discussed revolve around what the customer expects to see, and how the processes retailers need to implement to achieve a seamless customer journey lie behind the scenes. Adam stated how retailers can start with discovering a strategy. Retailers must identify what’s going on in the industry and, with their competition. Then, retailers must set their strategic direction. This is understanding at a high level where their operation wants to be and by when. Next is the future state design of a retailer’s technology architecture and infrastructure. Retailers must optimize system’s resources to meet key business demands. Finally, in the planning stage, retailers should develop their implementation roadmap and governance processes. All in all, the customer journey is expanding as consumers are engaging with retailer’s brand through multiple channels. Retailers must focus on meeting customer expectations and providing a seamless experience, whether their consumer is physically in their store or browsing online. 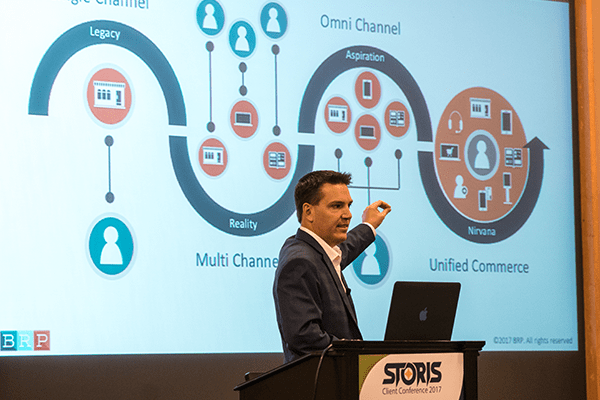 STORIS can help you achieve a Unified Commerce strategy. To learn more about Boston Retail Partners, visit www.brpconsulting.com.